Full & By , by Bill Schanen. Copyright ?2001. Published by Seaworthy Publications. ISBN 1-892399-08-3. 210 pp. $14.95. Order directly from the publisher at www.seaworthy.com Drop Everything...Let's Go Sailing! The mark of a good sailing book is one that makes you want to jump up, run down the dock, untie the lines to your boat and let the wind take you. Which is why I say, reader beware! when you read this book, because if you don't have a boat ready at your disposal, you might end up feeling inspired, but frustrated. Based on the editorial column of the same title, Full and By is a collection of essays by the editor and publisher of Sailing magazine, Bill Schanen. Bill Schanen's entire life has revolved around boats and sailing. His family sailed the Great Lakes while he was a kid, and his dad was so much into sailing, that he started his own magazine, simply called Sailing. As Bill grew up he not only cultivated his own love of sailing, he also followed in his father's footsteps into the world of newspapers and journalism. It's no small wonder that those two aspects of his life would converge, and that eventually he would become editor-in-chief and publisher of Sailing magazine. Schanen's love for sailing is contagious in his essays, which tell stories about inspirational sailors, moments at sea, and ruminations about the polemics of sailing and sailboats. It is as informative as it is inspirational, with lots of traditional sailing lore, lingo and a good sense of humor mixed in. 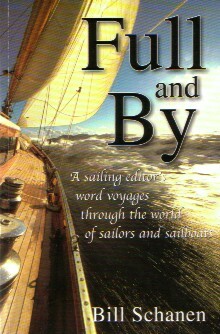 Full and By is different from other sailing books in that you can pick it up and put it down without compromising the plot or the details of the stories, because Schanen is a gifted wordsmith who carefully & eloquently composes his words so that the stories are always interesting, served up in readable portions. I do not mean to belittle Scahnen's book in any way by saying that this is an excellent bathroom book (I am not as eloquent as he is; I mean no disrespect). Schanen's book puts into words the exquisite joys of windy, spray in your face, 6 knots per hour, 20 degree heel sailing. The next time someone asks you why such an activity is enjoyable, you can simply smile and hand them this book. Just be careful, though, they might start asking to borrow your boat.